Chest Binder is applied to the thoracic region to compress and bind the rib cage and provide splinting to the sternum while allowing sufficient flexibility for comfortable breathing. Chest Binder is applied to the thoracic region to compress and bind the rib cage and provide splinting to the sternum while allowing sufficient flexibility for comfortable breathing. Strong elastic band gives good grip. 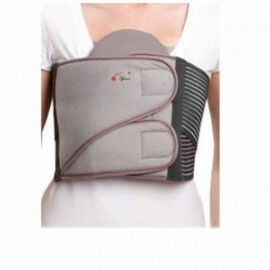 Reduces post operative pain and discomfiture. Facilitates phlegm expulsion after cardio thoracic surgery.